As the final minute ticked down in the Philadelphia Flyers’ season-ending 1-0 loss against the Washington Capitals Sunday afternoon, I felt disappointment. But more than that I felt pride in my favorite team. Not only did they fight back from an almost certain sweep, they won two games and held the best regular season team in the league to a one-goal win. Mix that with the up and down regular season and Philadelphia’s season was far beyond a success. Most pundits had the Flyers finishing in the 10-12 range in the Eastern Conference, let alone making playoffs. The team had little turnover from a bad 2014-15 season and a new coach pulled from the NCAA ranks. Sure, the Flyers still had stars Claude Giroux, Jake Voracek and Wayne Simmonds, but that was just three players – and only forwards. The defense, on paper, was looking like one of the worst Philly would ice since the 2006-07 season where they finished last in the league. Head coach Dave Hakstol was the first coach to make the jump from NCAA to the NHL since Bob Johnson went from Wisconsin to the Calgary Flames in 1982. To say Hakstol was embarking on a road with little prior success was an understatement. The Flyers didn’t rush out to a good start and the pre-season predictions seemed to be coming true, if not even worse. In the middle of November, number one defenseman Mark Streit was injured and the outlook seemed even worse for the Flyers. 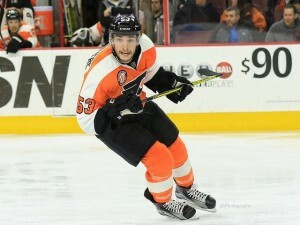 Shayne Gostisbehere was recalled and with it a came a change in Philadelphia’s play. It was a slow transition at first. The Flyers lost their first three of four with the Union alum, but with another defenseman that could get the forwards a puck, scoring became easier. That showed the most after the All-Star break. The Flyers compiled a 20-9-6 record after January in their playoff push. There were hiccups in losses to Carolina, Columbus and Toronto, but the team overcame each loss to make it to the postseason against everyone’s expectations. Besides Gostisbehere, the play of Brayden Schenn, Sean Couturier and Radko Gudas, among others, developed strongly giving fans more hope for the future. The day after the regular season ended and two days after the Flyers clinched a playoff spot, the team’s only owner in team history, Ed Snider, passed away after a battle with cancer, fueling the team even more as playoffs started. In the first game of the postseason, the Flyers held the high-flying Capitals to two goals, but worse than the loss was losing Sean Couturier for the rest of the series with a shoulder injury. The team struggled in the next two games, especially in Game 3, falling behind 3-0 in the series. Fans showed their displeasure in the 6-1 Game 3 loss and brought some unneeded criticism of the team and city by throwing bracelets handed out before the game onto the Wells Fargo ice. But just like in the regular season, the team showed resiliency in the face of adversity, winning Game 4 behind a change in net with Michal Neuvirth taking over. The Czech Republic native was the story in Game 5 also. The Philadelphia offense mustered only 11 shots throughout the whole game, but Neuvirth turned aside 44 Washington shots for a 2-0 shutout win. That forced a Game 6 and despite another strong effort from Neuvirth and the team in front of him, the Flyers season ended by the slimmest of margins. A lone marker from Nicklas Backstrom sent the Caps to the second round and the Flyers packing Sunday afternoon. While the ending wasn’t what the team or fans would have wanted for the Flyers, the season was better than most could have ever expected and should make the city of Philadelphia proud less than a week after bracelets were thrown on the ice because of poor play.